frillip moolog - Blog :: frillip moolog blog: Rolling together Marvin Gaye Chetwynd and The Magic Roundabout. It makes sense to me! Rolling together Marvin Gaye Chetwynd and The Magic Roundabout. It makes sense to me! Moments where you are reaffirmed that you are on the right artistic track are like buses; you can wait ages for one and then several come along all at once. Or maybe it is that they suddenly make sense all at once. I was lucky enough to get over to Nottingham Contemporary to see Marvin Gaye Chetwynd’s first solo exhibition at a public gallery in Britain. I managed to visit not once but twice..
On my first visit I had only 30 minutes to do a whirlwind visit. However I was so excited and so struck by the completely luscious and gorgeously sensual aesthetics of the work that I knew immediately that I would HAVE to get back before it closed. Claws from Marvin Gaye Chetwynd's Catbus. These claws are worn by several performers when her Catbus is part of a performance. The Catbus was originally a character in Hayao Miyazaki's animated film, My Neighbour Totoro. On my second visit, in the show’s closing week, Chetwynd’s work’s uplifting effect on me hadn’t dimmed at all. It was fantastic to be charmed by Cousin Itt (from Addams Family fame) and also good to see the Brain Bug (during one of it’s mid-day animated phases) but for me the absolute winner of the show was the sequence of scaled-down dioramas of film sets. This time I sat and listened to the soundscape which accompanied the dioramas and it was fantastic! For me the obvious fun that the two people giving their interpretations (both in basic schoolboy French - and the English translations of this) was so much fun. The fragile and precarious nature of the construction of the Diorama somehow just makes it all the more appealing. It is obvious that despite the serious issues that she tackles in her work (personal debt being one current theme) Marvin Gaye Chetwynd is very happy (in-fact she encourages) a good dose of irreverence and humour. Her work can be read on several levels so if you simply love textures, materials and a sense of the dramatic then her show at Nottingham Contemporary was perfect to visit. But if you are also intrigued by how an artist can make videos, performances and sculptural works which reference, low-brow B movies, bad sci-fi movies and juxtapose these with classical Greek philosophical treatises and literary classics then Marvin Gaye Chetwynd is the artist for you. Performance is at the heart of Chetwynd’s practice so actually everything that was in the show at Nottingham supported either previous performances or was used in The Greenroom, the performance that was specially commissioned by Nottingham Contemporary. You can watch an excerpt of the performance online. In the exhibition booklet it says that Chetwynd likes the excitement of problem solving when on a low budget and also the sense of autonomy and spontaneity that comes from working on her own or in a small team. 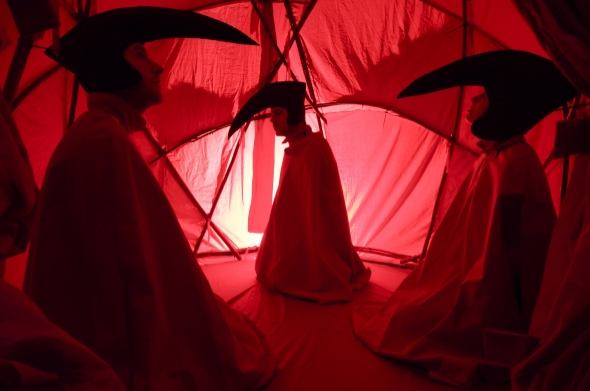 One of the gallery attendants told me that Marvin Gaye Chetwynd has a troupe of people who work with her, these are people that she has made an emotional connection with- people who are on the same wavelength as her. I understand this approach as her work is so individual and definitely energy driven and I can see why people want to not just watch it but to also be part of it. The gallery attendant also said that the members of her troupe are very loyal and many have worked on several versions of her performances and filmed pieces. Her work has an energy that I am very definitely attracted to. I also like when we don’t know the whole story I enjoy when things are not completely explained; when there are loose ends in a story or performance. I have been an avid fan of street theatre for years and very definitely a fan of the absurd. Marvin Gaye Chetwynd says, “I like Carnival Comedy and Nonsense”. Well me too! I identify with the cheerful, optimistic and mischievous Brian (the snail) and a favourite Magic Roundabout moment is when Brian is wearing his headphones and acting as an air traffic controller ‘trying’ to guide the runaway flying carpet (which has kidnapped Dougal and flown away with him). But Brian isn’t trying very hard and is actually loving seeing the grumpy and cynical Dougal getting dizzy as he is whizzed about on the carpet. 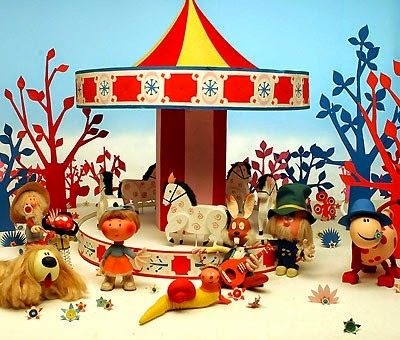 Moments of mischief are at the heart of the Magic Roundabout because the narrator Eric Thompson (being a bit suspicious of the French) took it upon himself to rewrite the original French scripts that went with the puppet production. 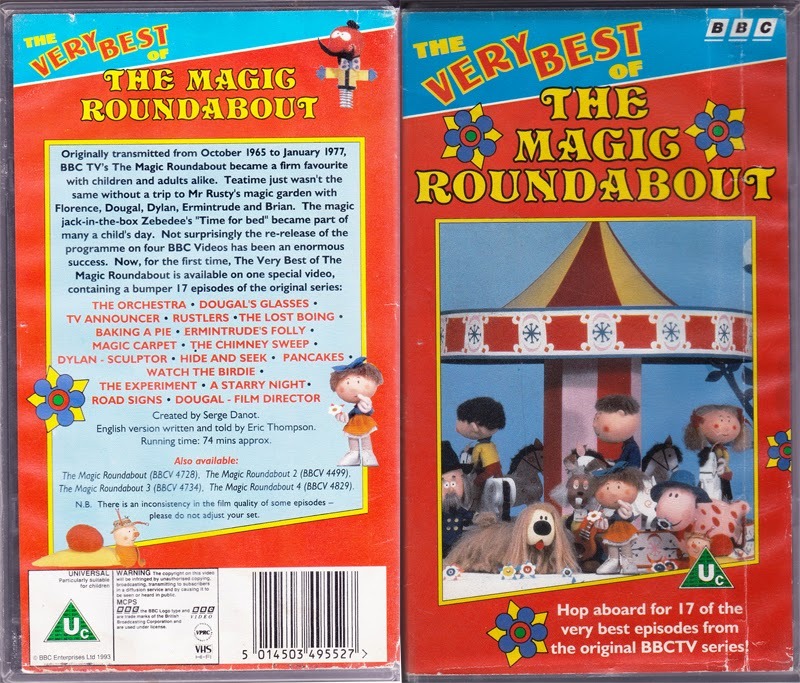 This 'not quite rightness' of the Magic Roundabout is one of the things that makes it appeal so much to me. As a visual person most I often make connections based on visual qualities rather than themes. When I encountered Zoe Walker and Neil Bromwich’s show, ‘The Encampment of Eternal Hope’ at The Baltic, Gateshead UK in October 2012 I almost felt that I was in an alternate version of The Magic Roundabout; the simplified spikey inflatable trees were the link in my mind. I felt like a small Florence in the Magic Roundabout garden. Although Neil Bromwich and Zoe Walker’s work was on a serious note looking at ways of coping with possible future apocalypse - (Making apocalyptic predictions for 21 December 2012 – the end date for the Mayan Calendar – as an imaginative catalyst, the project envisages a post-apocalyptic utopian community, a kind of ‘garden of earthly delights’) you can’t help but be lured in by the colours, simplified / childlike forms of the trees and the meditative and so possibly calming and hopeful vibe of the processional performance (videos of which were playing in the gallery space) that were part of the show. Rolling these all together in my mind I ask myself what is it that I am drawing from these three disparate creative works and artists?